Demega formulations India is involved in offering excellent quality medicines to our most valued clients. Our offered products are widely appreciated by our clients which are situated all round the world. Baby care, through different products help a lot e.g. Baby Skin Care, Baby Baths, Burping, Colic, Crying Babies, Gas, Jaundice, Infant Formula are considered as nutritionally complete meals for babies until about six months of age so it is recommended to wait till then to start solid foods. 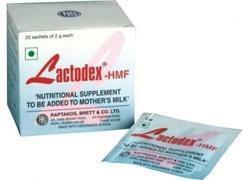 Demega formulations India is a prime exporter of LACTODEX Milk Fortifier Milk SACHETS is the only Human Milk Fortifier available , evidence suggests that it is effective in improving short-term growth in preterm babies as problems arise in premature Very Low Birth Weight and the Extremely Low Birth Weight babies and milk supplements like "Lactodex HMF(Nutritional Milk Powder)" may be added to breast milk in small quantities and given between feeds. Demega formulations India is a prime exporter of "AZY(Azithromycin)" is one of the world's safest , and is derived from erythromycin. 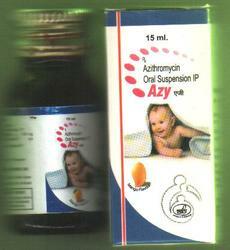 "AZY(Azithromycin)" is used to treat or prevent certain bacterial infections, those causing middle ear infections, tonsillitis, throat infections, laryngitis, bronchitis, pneumonia, Typhoid, and sinusitis. Demega formulations India is a prime exporter of Nourishing and Massaging Baby Oil. used for dry and under nourished skin. "HIMALAYA(Nourishing Baby and massage oil)" tones and moisturizes the skin and is Pure, mild and gentle baby oil. Demega formulations India is a prime exporter of Diaper Rash Cream promotes effective healing, soothes red and irritated skin and forms a protective layer on baby's skin.fights infections and helps bone development and is a treatment of sores. Demega formulations India is a prime exporter of "Himalaya(Baby Cream)" is specially formulated to protect your little one's chapped cheeks, 'crawler's knee', tender nose and rubbed elbows. "Himalaya(Baby Cream)" has Olive Oil with vitamin E, which nourishes, protects and softens skin and prevents chafing. protects against irritating wetness and windburn . "Himalaya(Baby Cream)"has Country Mallow, an antioxidant, which protects baby's skin from germs. "Himalaya(Baby Cream)"has Licorice which helps relieve symptoms of itching, swelling and redness. 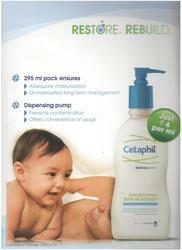 "CETAPHIL RESTODERM(cetyl and stearyl alcohol) lotion" uses advanced technology to cleanse, hydrate and protect baby skin. cetyl and stearyl alcohol lotion is marketed in USA,UK by brand name"CETAPHIL RESTODERM"
Looking for Baby Care Medicine ?